In Ossiriand dwelt the Green-elves, in the protection of their rivers; for after Sirion Ulmo loved Gelion above all the waters of the western world. The woodcraft of the Elves of Ossiriand was such that a stranger might pass through their land from end to end and see none of them. They were clad in green in spring and summer, and the sound of their singing could be heard even across the waters of Gelion; wherefore the Noldor named that country Lindon, the land of music, and the mountains beyond they named Ered Lindon, for they first saw them from Ossiriand. Beleriand, Middle-earth was the place to be, for any Elf wanting a piece of the action in the First Age. Beautiful and deadly, and yet wide and expansive enough to accommodate both the would-be King of the world, the various Elf-lords, and even assorted others who remained unnoted. In the remote North, the regions of everlasting cold, where Morgoth had ice and smoke as his decorating theme were his stomping grounds, his proud property collection stylishly named Dor Daedeloth. Utumno was his original headquarters. But since his return from Valinor, Morgoth had taken up residence in Angband, since Utumno was ground zero in the War of the Powers but Angband escaped complete ruin, being only practically, but not thoroughly, razed by the Powers. Ered Engrin, the Iron Mountains. Raised by Melkor as a buffer for Utumno and Angband. a great tunnel, opened in the south of the mountains was dug, and “there he made a mighty gate”. Sitting behind this gate were the triple towers of Thangorodrim, built of filth and slag from his subterranean realm. Fingolfin was held overlord of all the Noldor, and Fingon after him, though their own realm was but the northern land of Hithlum; yet their people were the most hardy and valiant, most feared by the Orcs and most hated by Morgoth. Hithlum. West of Thangorodrim. Rulers: Fingolfin and Fingon. Calvary was a big feature of their forces, with many of their horses bred from broodstock out of Valinor – given to Fingolfin by Maedhros in atonement of his losses, for they had been carried by ship to Losgar. Ard-galen was their grazing grounds. Nevrast. West of Dor-lómin, beyond the Echoing Mountains. Ruler: Turgon (until he left for Gondolin). Capital: Vinyamar, under Mount Taras beside the sea. Highlands of Dorthonion. South of Ard-galen. Rulers: Angrod and Aegnor. Pass of Sirion. Between Dorthonion and the Shadowy Mountains. Havens of the Falas. West coast of Beleriand, south of Nevrast, abutted by Nargothrond, Finrod’s lands. Ruler: Círdan. Thus the sons of Fëanor under Maedhros were the lords of East Beleriand, but their people were in that time mostly in the north of the land, and southward they rode only to hunt in the greenwoods…. and there also other of the Elf-lords would ride at times, even from afar, for the land was wild but very fair…. But none of the Noldor went ever over Ered Lindon, while their realm lasted; and little news and late came into Beleriand of what passed in the regions of the East. Above Aros in the north marches of Beleriand, dwelt the sons of Fëanor, chiefly Maedhros in the March of Maedhros, aka the lands north of the Hill of Himring. There his riders often passed the vast and empty northern plain of Lothlann, east of Ard-galen, for east of Dorthonion Beleriand was the most vulnerable. Pass of Aglon. Between Himring and Dorthonion, exceeding steep on its west, and a gate into Doriath. Held by Celegorm and Curufin, they fortified the pass, and kept safe all the land of Himlad southward between the River Aros that rose in Dorthonion and his tributary Celon that came from Himring. Maglor’s Gap. Between the arms of Gelion. Held by Maglor. 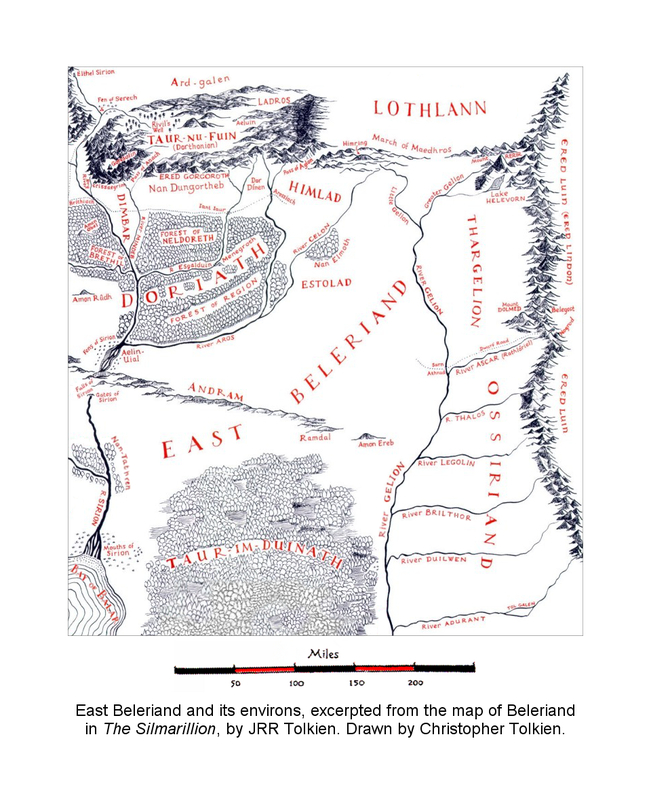 The only weakness is a spot where the “the hills failed altogether; there it was that the Orcs came into East Beleriand before the Third Battle.” This was remedied during the Siege by strength of Noldorin cavalry. Ossiriand, the Land of Seven Rivers, lay between Ascar in the north and Adurant in the south, and between Gelion and Ered Luin. Ruler: Denethor, son of Lenwë, until his death in the First Battle in the Wars of Beleriands. No ruler thereafter. These are the Nandor turned Laiquendi. Finrod managed to make friends with them however, with his love of wandering the land where it was “wild but very fair.” This was also where Beren and Lúthien settled after their return from their epic trip to the after-life. The “no-land” of Nan Dungortheb was between Mindeb and the upper waters of Esgalduin, a region filled with fear, with the Girdle of Melian fencing the north march of Doriath on one side, and on the other were the sheer precipices of Ered Gorgoroth, Mountains of Terror, rising from Dorthonion. Ungoliant had her nest there for a bit. It was an area shunned by the living for “the thin waters that spilled from Ered Gorgoroth were defiled, and perilous to drink, for the hearts of those that tasted them were filled with shadows of madness and despair.” Even the Noldor would cross Nan Dungortheb, by paths near to the borders of Doriath and furthest from the haunted hills. Esgalduin was eastwards of Nan Dungortheb, accessible by a path made before Morgoth returned. There stood in the days of the Siege the stone bridge of Iant Iaur. Dor Dínen, the Silent Land, abutted Esgalduin. Aros could be reached from the Silent Land and crossing the Arossiach (which signifies the Fords of Aros) from Dor Dínen. Andram, the Long Wall was a hill range in the southmost reach of Nargothrond, some twenty-five leagues east of the gorge of Nargothrond where Sirion fell from the north in a mighty fall below the Meres of Twilight. Its end was called Ramdal, the Wall’s End, in East Beleriand. The Wall grows less sheer the further east it stretched, “for the vale of Gelion sloped steadily southward, and Gelion had neither fall nor rapids throughout his course, but was ever swifter than was Sirion. Between Ramdal and Gelion there stood a single hill of great extent and gentle slopes, but seeming mightier than it was, for it stood alone; and that hill was named Amon Ereb. Taur-im-Duinath, the Forest between the Rivers, was south of the Andram, between Sirion and Gelion, a land of tangled wild forest, deserted for the most part. Gelion the river rose from two headwaters: Little Gelion, from the Hill of Himring, and Greater Gelion from Mount Rerir. From where they merged, the river flowed south for for forty leagues before his tributaries added to the flow. “Before he found the sea he was twice as long as Sirion, though less wide and full, for more rain fell in Hithlum and Dorthonion, whence Sirion drew his waters, than in the east.” The six tributaries of Gelion came from Ered Luin: Ascar (that was after named Rathlóriel), Thalos, Legolin, Brilthor, Duilwen, and Adurant, swift and turbulent streams, falling steeply from the mountains. Tol Galen, the Green Isle was a river isle nearly midway in the stream of Adurant where it divided and then joined again. In short, Thingol controlled the south, Círdan had the to-die-for sunset view all to himself on the edge of the western seaboard, and the Laiquendi lurked in the east. 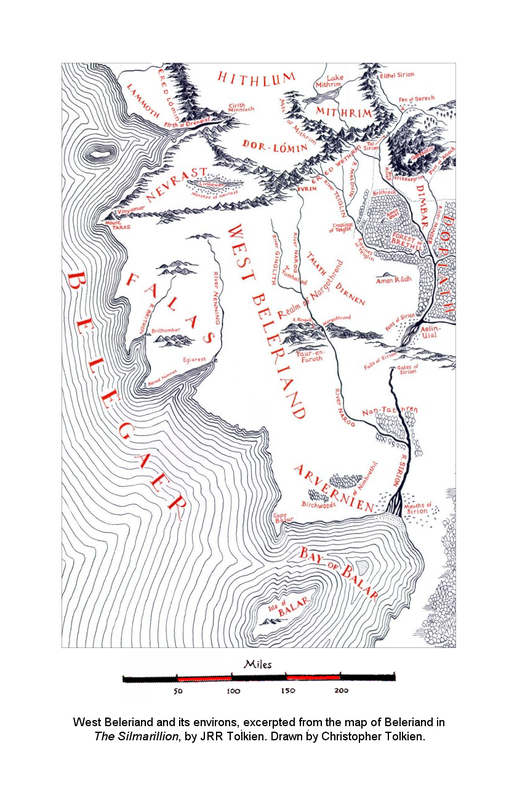 Arrayed northward west to east (and squishing Doriath north, east and west as well), and scrutinising the even more northerly stranglehold of Morgoth was the Noldor collective, especially the brood of the late Fëanor clustered eastwards. There the various Houses jostled cheek to jowl in the name of the Siege, even as awkward matters plagued internal administrative processes. Really really well done with this! I always sort of snooze my way through this chapter. It’s basically the land version of 1st Chronicles. Your added maps (even one from the Atlas) are super helpful . Also, big score for bullet points! I do sleepwalk my way through this chapter too! That’s why I had to make myself do this, just to snap out of the funk; though I did end up doing a lot of the quotey thing because how do you rephrase what the prof said best already?